ontargetarmory has no other items for sale. Item works but i had to do some filing of the hole to make it fit though. The replacement gear works Great!!! Easy to deal with seller. Fast shipping. Unit works. Thank you. fast shipping; gear was BLACK; got it working again thanks! The gear was shipped and received in a timely manner. The material seems durable. The design of the gear is NOT an exact match to the original gear. 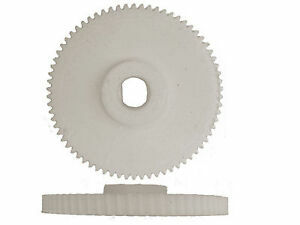 The major diameter is accurate, but the teeth on the original gear have a helical slant to them, while the replacement teeth are entirely vertical. The press fit center hole seems too large, so the press fit is a little loose and the gear is able to wiggle back and fourth just slightly around the axis or rotation. The replacement fits and works for now, but could be problematic down the line because the teeth don't fit together perfectly with the motor gear, which also has helical slanted teeth. Because of this, the effective diameter of the replacement gear is slightly larger, and the motor induces a bending stress on the gear as the teeth attempt to align themselves. Looking at the pictures in the product description, it is clear to see this design flaw now, so I place no blame on the seller for this. As stated earlier, the gear is able to fit and work, though it isn't a perfect design match or fit. The gear fits correctly, but the center hole is a bit under size. Extreme force was required to get it onto the shaft and it could not be removed again without destroying the entire sharpener. The installation loads were such that the sharpener rotating parts were slightly distorted so that a pencil would have wood clear to the end of the point on one side after sharpening. The sharpener already had a tendency to do this and after the gear replacement it was worse. The bottom line is that the sharpener is not worth repairing... invest in a new one. Thought I had to get rid of my old fashioned pencil sharpener from my husband- instead replaced Gear- works great- easy to assemble! having that part available helped me save my pencil sharpener. otherwise i would have had to throw it away. the part came quickly and it was the right part, of comparable quality to the original. thanks for the good work.